I had 4 oranges (2 from a previous delivery) and 1 lemon from Boston Organics that I wanted to use up, so I googled "orange lemon sorbet" and found this recipe for fresh orange sorbet from Cooking Light. The recipe said that I'd need about 10 medium-size oranges and 2 medium-size lemons, but I found that the 4 oranges made enough juice for half the recipe. I also added a splash of citrus vodka to the mixture right before adding it to the ice cream maker to keep it from being too icy. Combine water and sugar in a small saucepan, and bring mixture to a boil. 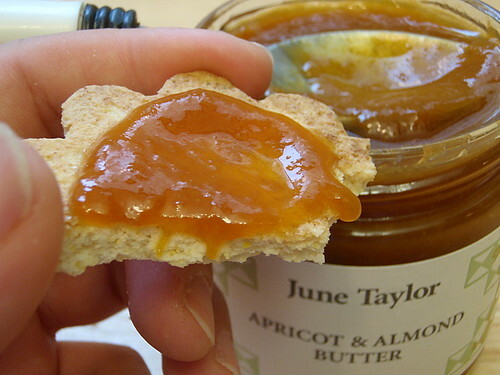 Add orange rind strips; reduce heat, and simmer 5 minutes. Remove and discard orange rind strips. Remove liquid from heat, and let cool to room temperature. Stir in orange juice and lemon juice. Chill in refrigerator until completely cool. Right before churning, add the splash of citrus vodka. 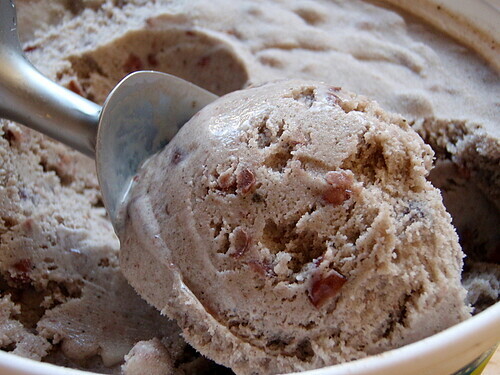 Freeze in ice cream maker according to manufacturer's directions. Serve immediately. 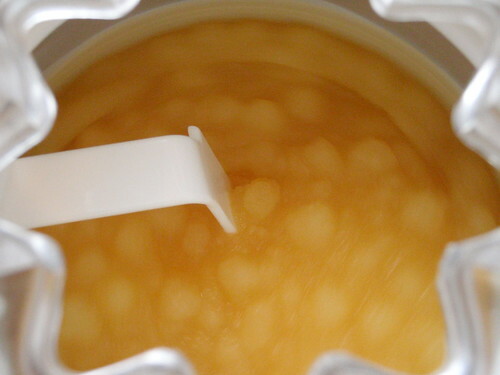 When I was churning the sorbet, I noticed these icy globules forming which made me concerned that there might be globs of ice in the sorbet surrounded by sticky orange syrup (similar to what happens when you freeze orange juice), but the texture of the sorbet ended up being pretty uniform. I did neglect to read the instructions to the end and ended up freezing the sorbet overnight instead of serving it immediately. 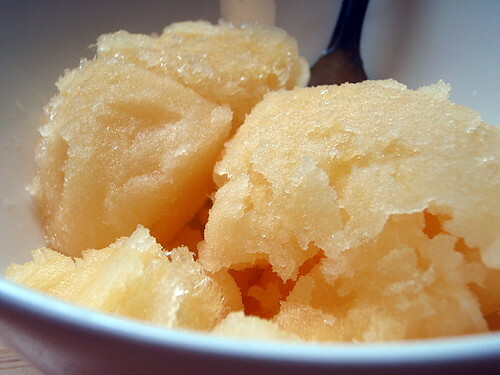 Despite the addition of the alcohol to lower the freezing temperature, the sorbet did get quite hard and icy so that the texture was more like a granita. 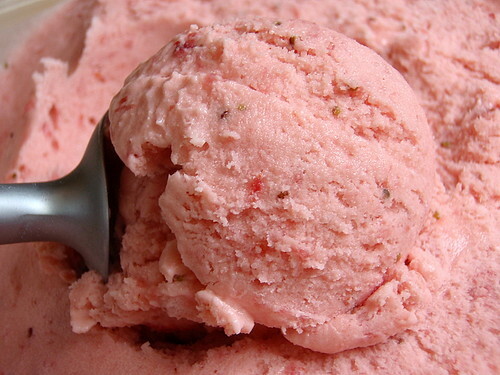 It was still quite refreshing, however, and I found the combination of the flavor and texture strangely addictive. I love how it tastes like fresh-squeezed orange juice even days after it was made. 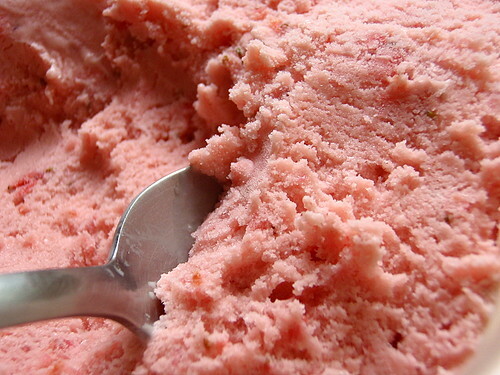 And the fact that it was ice cold made it all the more perfect as a summer dessert or palate cleanser. -Blend all these ingredients together and take 3 cups of the blend and mix it with the 1 cup of sugar and 1 cup of soy sauce. I laughed when I first read this because of the lack of instructions on how to prepare the fruits. Was I supposed to peel and core the apple and pear? I wasn't supposed to throw the whole kiwi into the blender, right? When I asked him for clarification, he said that what he sent me was what he got verbatim from his Korean friend. There was also something in the recipe about "tenderizing" the short ribs, but there were no details as to how to do that. Seeing as how kalbi meat is so tender already, I figured I could just skip that part. Perhaps the hardest part about making kalbi is finding the right cut of meat. You want to get beef short ribs that are cut across the bones, not with, which is how they're usually sold in American grocery stores. I just found out via the recent post on thekitchn.com that this is called a "flanken" count (not the same as flank steak). The only place I've found this cut is at a local Korean grocery store. Sara Kate, who wrote the post, suggests "slicing the traditional three-rib short ribs down to the bones length-wise and splaying them on the grill" if you can't find the flanken cut. Cut the kiwi in half and remove the meat using a spoon. 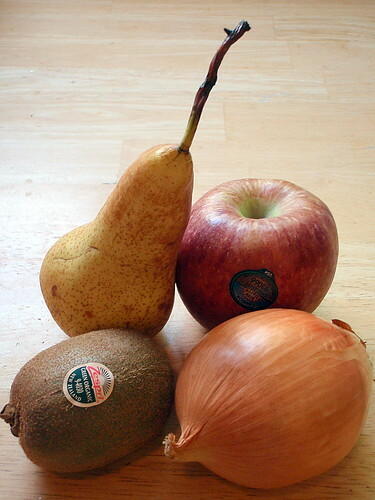 Add the kiwi meat to a blender along with the onion, apple, pear, garlic, mirin (or rice wine) and 7-Up. Puree using the blender. 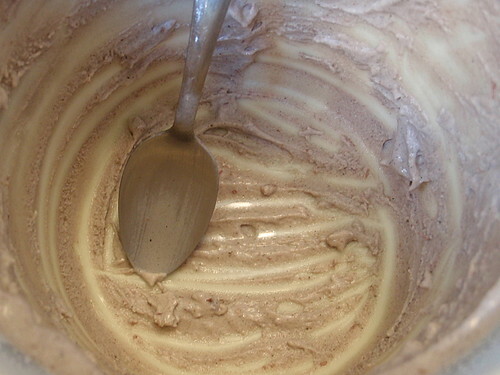 Measure out 3 cups of this mixture into a medium mixing bowl and add the soy sauce and sugar. Arrange the ribs in a baking dish (you may have to use two depending on the size of your dish) and pour the marinade over them, making sure that all surfaces are exposed to the marinade. Alternatively, you can use two gallon-sized freezer bags. 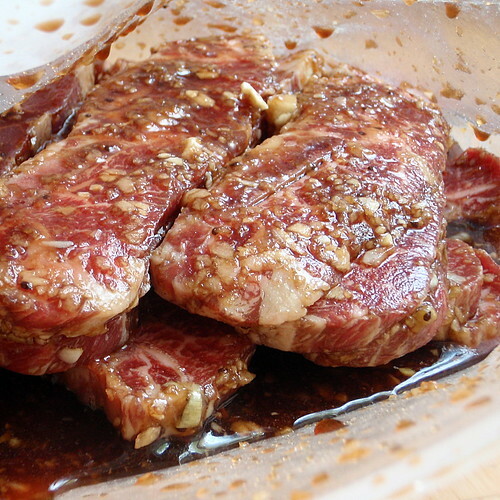 Marinate in the refrigerator for at least 24 hours, turning the ribs around a few times so they marinate evenly. Grill the ribs over high heat. I do about 3 minutes on each side because my ribs are cut pretty thin, but you may have to grill yours longer if yours are thicker. 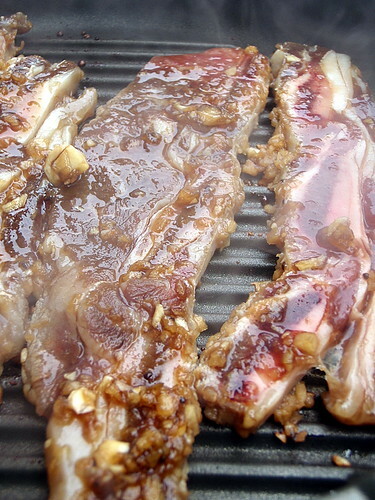 If you don't have a grill, you can also pan-fry or use the broiler to cook the ribs. I used my electric grill and cooked it outside because the smell is heavenly, but not something you want to stick around for days. 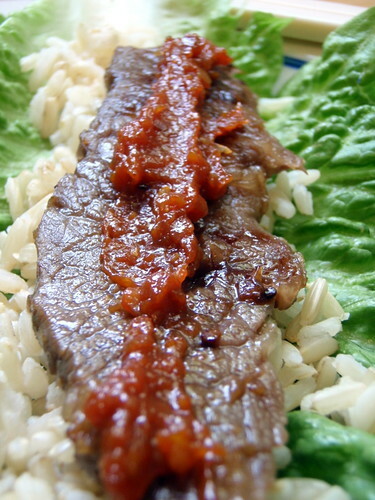 Serve with washed Romaine lettuce leaves, cooked rice, and ssamjang (Korean spicy bean paste). 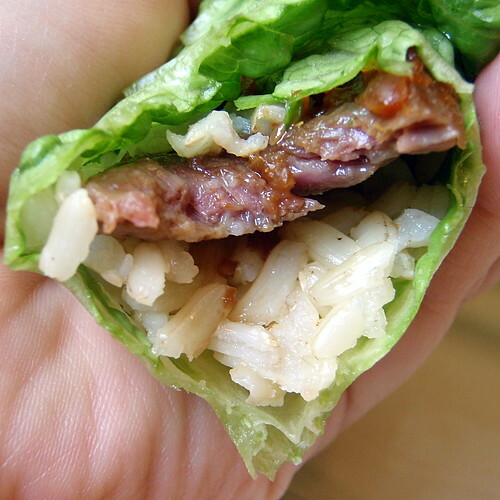 Each person should remove the meat from the bones and wrap the meat in the the lettuce along with the rice and bean paste. Don't forget to gnaw on the meat in between the bones; it's hard to get to, but oh so worth it! If you're not planning on cooking the ribs right away, you can freeze them in the freezer bags after adding the marinade. When you're ready to cook them, defrost defrost overnight in the refrigerator. Wow, I can't believe I've been doing this for twelve weeks already! I've definitely enjoyed trying to figure out how to use up all the produce every two weeks and my diet has definitely benefited from being "forced" to eat more fruits and veggies than I would if I didn't have this service. From the last delivery, I ate most of the fruit as is, made guacamole from the avocado, tomato, and onion; tomato and eggs over rice with the rest of the tomato; caramelized the onions and carrots (basically the only way I will eat carrots); sauteed the yellow squash with garlic; and made coconut curry noodles with the collard greens. This week I got 1 Bosc Pear, 2 Cameo Apples, 2 Fair Trade Bananas, 1 Kiwi, 1 Lemon, 2 Valencia Oranges, 1 bunch Asparagus, 1 bag Baby Carrots, 1 bunch Chard, 1 Salad Tomato, and 1 Zucchini. 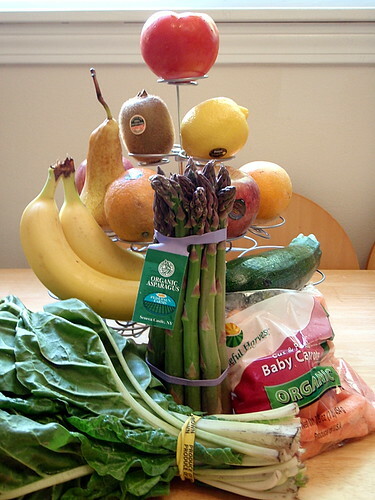 I was actually a little confused when I saw the chard (the leafy green vegetable in the picture above) because I'm more familiar with the red stem kind. But after googling for images of "chard" I guess there are non-red steam kinds of chard. When I checked to see what the inaugural challenge for the Daring Cooks was, I just happened to be in San Francisco, the same city where the Zuni Cafe resides. Having never had ricotta gnocchi, I figured I better stop by the restaurant and taste the real thing before I went about trying to make it. I'm really glad I did because I probably would've have been tempted to douse my gnocchi with some type of heavy tomato-based sauce, but what this ultra-light pasta needs is something much more simple. Something like browned butter and sage. Now I won't lie and say this recipe was simple, because it's not. (And I've tried to simplify the recipe as much as possible here.) You need to drain the ricotta the day before, and then there's this really delicate handling of the gnocchi while forming it that definitely needs a lot of careful attention. But if you do everything correctly, what you'll end up with is so light and fluffy in texture, yet so rich and decadent in taste that you'll be thinking about these long after you've finished your meal. I know I was. The day before you want to make the gnocchi, line a sieve with cheesecloth or paper towels and place the ricotta in the sieve. 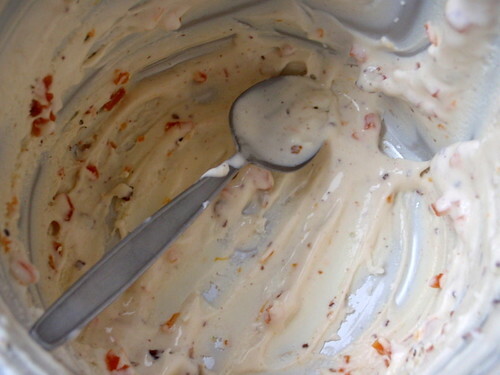 Cover it and let it drain with a bowl underneath for at least 8 hours and up to 24 hours in the refrigerator. Place the drained ricotta in a large bowl and mash it as best as you can with a rubber spatula. Add the lightly beaten eggs to the mashed ricotta and stir to combine. 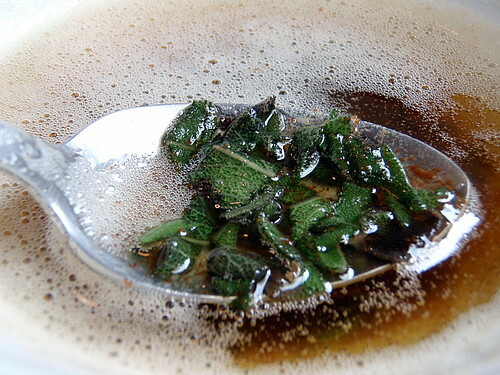 Melt the tablespoon of butter with the chopped sage. Add a little at a time to the ricotta and egg mixture while stirring so that the eggs don't cook. Add the Parmigiano-Reggiano and the salt. 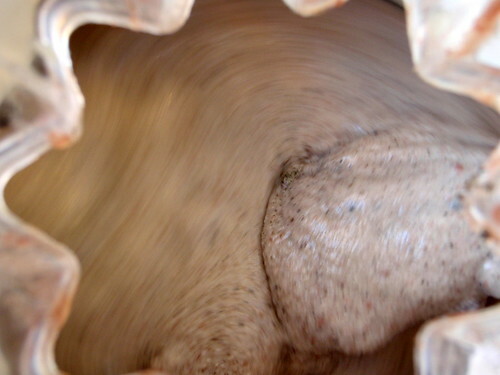 In a large, shallow bowl, make a bed of all-purpose flour that’s 1/2" deep. Using a tablespoon, scoop up about a tablespoon of batter and then holding the spoon at an angle, use your finger tip to gently push the ball of dough from the spoon into the bed of flour. 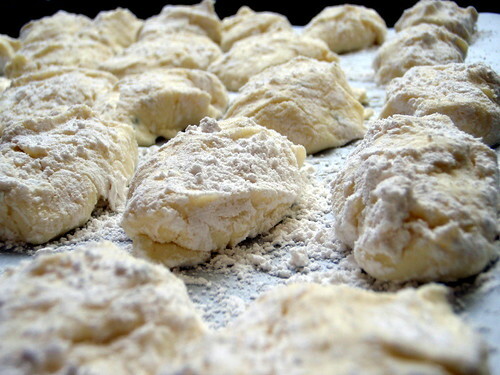 Use your fingers to very gently dust the gnocchi with flour. Gently pick up the gnocchi and cradle it in your hand rolling it to form it in an oval as best as you can; at no point should you squeeze it. 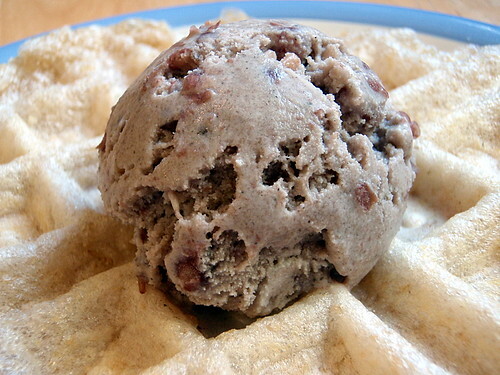 What you’re looking for is an oval lump of sorts that’s dusted in flour and plump. Gently place your gnocchi in the simmering water. It will sink and then bob to the top. From the time that it bobs to the surface, you want to cook the gnocchi until it’s just firm, about 3 to 5 minutes. Line the sheet pan with wax or parchment paper and dust it with flour. Form the rest of your gnocchi and place on the sheet pan. Store the formed gnocchi in the refrigerator for an hour prior to cooking to allow them to firm up. 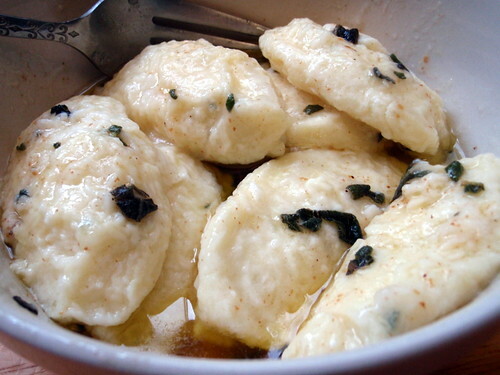 While the gnocchi are in the refrigerator, make the sauce by melting the 1/4 cup of butter in a small saucepan. Continue to cook and stir until it turns a golden brown (if it gets too dark it will become bitter). Remove from heat and add the sage, salt, and nutmeg. Set aside. In the largest pan or pot that you have (make sure it’s wide), bring at least 2 quarts of water to a boil. Once the water is boiling, salt it generously. Drop the gnocchi into the water one by one. Once they float to the top, cook them for 3 to 5 minutes. With a slotted spoon, remove the gnocchi from the boiling water and gently drop into the butter sauce. Carefully roll in the sauce until coated. Serve immediately. If you don’t want to cook your gnocchi right away or if you don’t want to cook all of them, you can make them and freeze them. 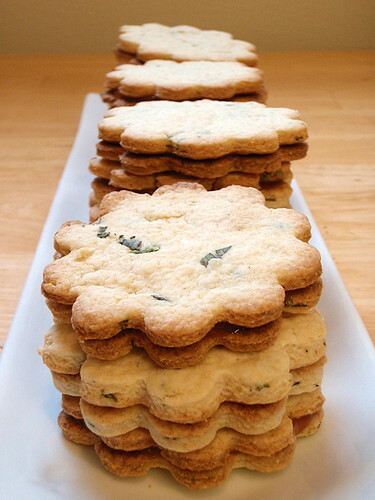 Once they are formed and resting on the flour-dusted, lined tray, place them uncovered in the freezer. 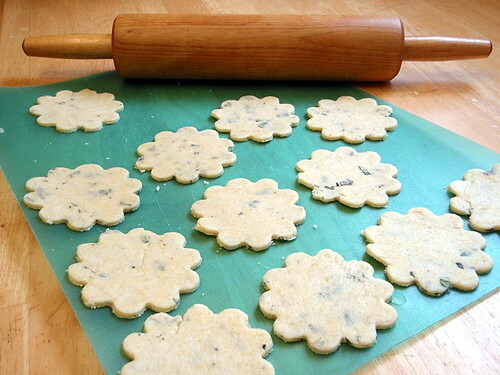 Leave them for several hours to freeze. Once frozen, place them in a plastic bag. Remove the air and seal the bag. Return to the freezer. To cook frozen gnocchi, remove them from the bag and place individually on a plate or on a tray. Place in the refrigerator to thaw completely. Cook as directed for fresh gnocchi. I have to say, if it hadn't been for this Daring Cooks first challenge, I doubt I would've ever ordered the ricotta gnocchi at Zuni Cafe, much less try to make it. (I probably would've gotten the roast chicken with warm bread salad because I've been dying to make it ever since I heard about it.) I'm glad I did, though, if only to broaden my foodie and cooking experiences, and I can't wait to find out what the next month's challenge is. 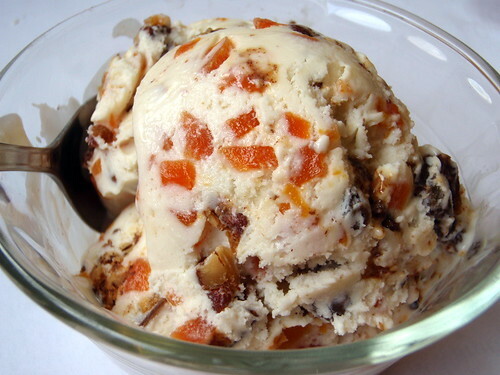 I opted out of the previous delivery because I knew I was going to be out of town, but here's how I used the last delivery: I made a fruit salad out of the apples, pears, oranges, kiwis, and bananas; ate the grapefruit and tangelos; made David Lebovitz's carrot cake ice cream with the carrots; put the scallions in water and used some for making tofu with spicy garlic sauce and the bacon and egg bunny buns; made coconut curry noodles with the collar greens and green pepper; made Korean-style soy sauce potatoes with the potatoes; and used the yellow squash in hot pot. 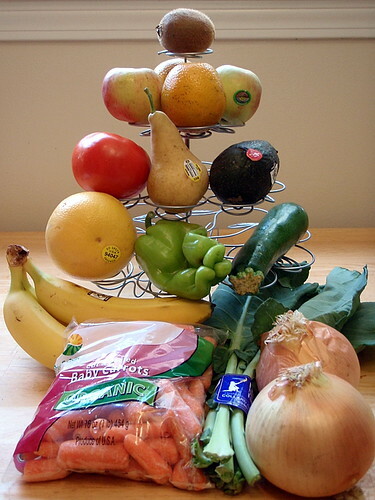 This week I got 1 Bosc Pear, 3 Fair Trade Bananas, 2 Fuji Apples, 2 Kiwis, 1 Red Grapefruit, 2 Valencia Oranges, 1 bag of Baby Carrots, 1 Cubanelle Pepper, 1 Fair Trade Avocado, 1 Salad Tomato, 1 Yellow Squash, and 1 bunch Collard Greens. I think you already know what I'm going to make with the collard green, and I'll probably throw in the pepper and maybe the squash. I still have some limes from making the mango lime sorbet, so I'll probably make guacamole with the avocado, onions, and tomato. 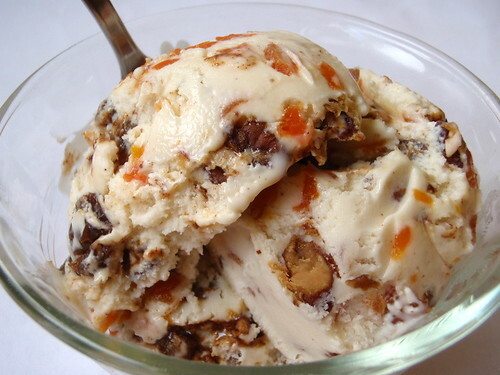 Any suggestions for what to do with the carrots if I don't want to taste them (other than carrot cake and carrot cake ice cream)? A couple of weeks ago I got two Boston Organics deliveries in a row with collard greens and broccoli. I was fine with the broccoli, other than possibly getting bored with it, but I didn't really want to make braised collard greens with bacon again. So when I saw this recipe for creamy coconut collards, I was pretty intrigued. I would never have thought that collard greens, a staple in Southern soul food, could be used in an Asian-inspired dish. But it's a brilliant combination; the slightly sweet creaminess of the coconut milk tempers whatever bitterness the collard greens may have left after braising, and the curry gives it just enough kick to cut through the cream. 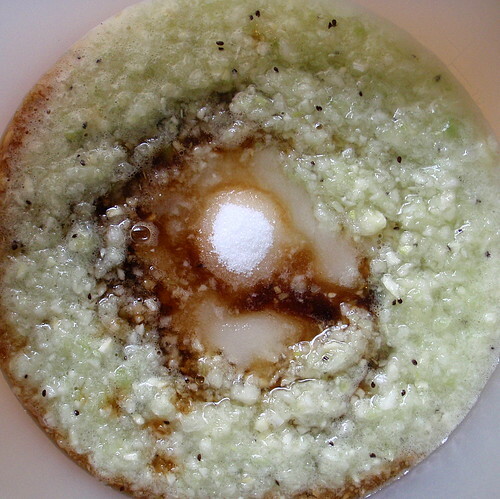 The only thing was, served over rice, the texture was just too blah. 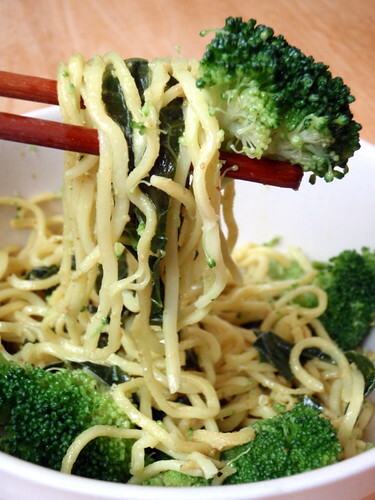 So I tried it over chow mein noodles (not the crispy La Choy kind; the kind that you boil), added some stir-fried broccoli, and the dish turned into something sublime and much, much greater than just the sum of its parts. I've already made this twice and will most likely make the next time I get collard greens; it's really that good. Cut off the florets from 3 stalks of broccoli to end up with about 2 cups of florets. Mince a clove or two of garlic. Heat 2 tablespoons of oil in a wok and add the garlic and salt. 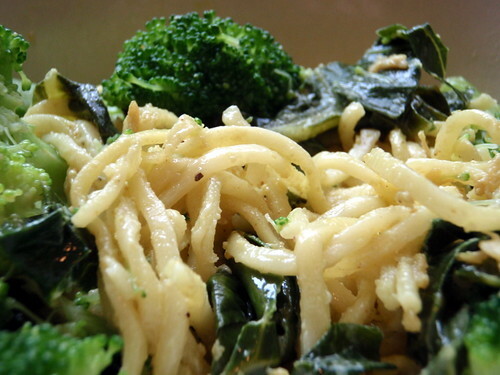 Toss in the broccoli and stir fry until bright green, about 2-3 minutes. Add about 1/2 cup of water and cover to finish cooking by steaming about another 5 minutes. Once it is done, remove the broccoli from the wok and set aside. Wash the collard greens, remove the stems, and cut the leaves into ribbons. Mince another clove or two of garlic. Heat up some oil in the cleaned wok and add the garlic and collard greens. Stir fry for a couple of minutes and then add a can of coconut milk and curry powder to taste (start with 2 teaspoons). Cook over medium-high heat for 8-10 minutes until the collard greens are done and the sauce is slightly thickened. Add the broccoli and toss. Remove from heat. You can add chicken or pork to the dish by cutting it into bite-sized pieces and browning it in the hot oil before adding the garlic and collard greens. If you can't find steamed chow mein, you could probably substitute Hong Kong style egg noodles (like the kind I used for the pan-fried noodles), ramen, or possibly even angel hair cooked al dente. I probably wouldn't use anything too thick or chewy; the reason why the noodles worked while the rice didn't is because you want some bite in the texture. I made this with regular coconut milk, but next time I will try it with reduced fat coconut milk. ETA: I tried it with the reduced fat coconut milk, and it wasn't anywhere near as yummy. If you try making this, please let me know what you think!